Switzerland's National Bank (SNB) is to impose an interest rate of minus 0.25% on large amounts of money deposited in the country. The negative rate will apply to "sight deposits" - a type of instant access account for banks and large companies - of more than 10m Swiss francs (£6.5m). But why would a bank want to cut the value of deposits it holds, or charge depositors? Normally borrowers pay lenders a rate, typically as an annual percentage, on the amount borrowed. So, for example, when people deposit money in a bank, they normally expect to get back some form of interest on the account. However, when interest rates are negative, this relationship is reversed, and lenders have to pay to lend money or to invest. The general idea of imposing negative rates is to discourage people or organisations from certain investments. Why do banks impose negative interest rates? In short, for different reasons, but usually to try to stabilise the economy in some way. The Swiss National Bank brought in a negative rate to try to lower the value of the Swiss franc, which has been rising as people look for safer investments. Factors such as a sharp drop in the value of the Russian rouble and steeply falling oil prices have spooked investors. 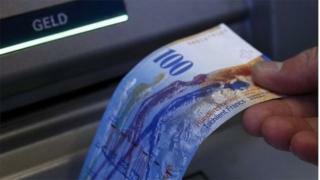 Switzerland normally sees money flowing into its coffers in difficult economic times. However, if the currency is too strong, this can hit exports, as products become more expensive. In June, the European Central Bank (ECB) imposed a negative interest rate, but for different reasons. It wanted to try to stop banks from depositing money with it, and instead lend to eurozone businesses. How effective negative rates are depends on many different variables. In the case of Switzerland, the immediate impact was a temporary fall in the franc against the euro, but the currency was trading slightly higher by late morning. Its longer-term impact remains to be seen. The ECB's negative interest rate was announced as part of a raft of measures designed to stimulate the eurozone economy, which continues to stagnate. Are we going to see more of it? It very much depends on what banks want to achieve, and whether they think it's going to work. Negative interest rates are rarely brought in, and are seen as quite a radical measure. While negative interest rates are normally aimed at institutional investors, in the long term they can have a detrimental effect on savers, if investors decide to recoup the costs of the rate by levying charges on consumers. Besides, central banks have a range of other measures available to them to stimulate the economy. For example, since the global financial crisis, both the Bank of England and the Federal Reserve have used so-called "quantitative easing" - buying assets to boost the supply of money - as an economic stimulus. The Bank of England considered imposing a negative bank rate in February 2013, but decided against it in May of that year. However, it said at the time that negative interest rates remained an option. With the global economy still fragile, negative rates remain a tool that banks could use.